More than 4,000 pupils from Scotland’s poorest communities will be going to university, officials have confirmed. Northfield, Seaton and Mastrick in Aberdeen – have risen across Scotland by 13%. The total number of students from Scotland getting a place at a Scottish university also hit a new record of 27,830. 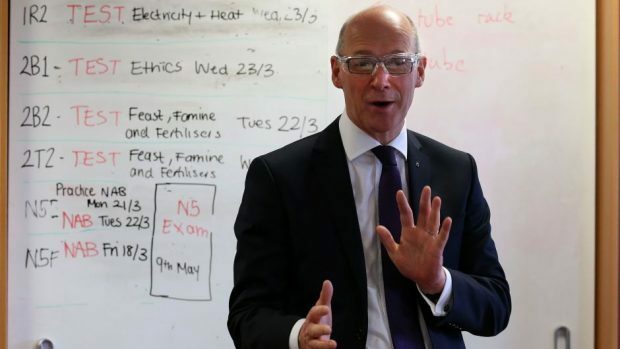 Education Secretary John Swinney said the results marked the latest progress in the Scottish Government’s drive to widen access to higher education. He said: “These new figures show that, year after year, we are making good progress in widening access with the number of students from Scotland’s most deprived areas now up 20% in just two years. National Union of Students (NUS) president Luke Humberstone welcomed the “fantastic” results but called on the Scottish Government to do more to support students financially. He said: “What’s important now is ensuring that all students have the support they need to build on these great results and succeed in higher education, accessing all the opportunities it can present. “Too often the current system forces students to choose between taking on commercial debt, working an unreasonable number of hours, or dropping out altogether. Scottish Qualifications Authority (SQU) chief executive Janet Brown, who is also Scotland’s chief examining officer, said the pass rate for higher exams remained largely steady from the previous year. She said: “The ever-increasing demands of modern society means that we have to continually ensure our full range of qualifications and awards enable learners to develop the skills and knowledge required by employers, training providers, educators and society. “Our diverse qualifications allow each and every young person in Scotland to access an award at a level which meets their skills and aspirations.